New Joint Commission standards for CT technologists require additional certifications as part of a safety push. In mid-February, The Joint Commission approved new requirements for diagnostic imaging services that take effect for hospitals and critical access hospitals starting on September 1, 2016. The main thrust is for technologists who perform diagnostic CT exams to have or obtain advanced-level certification by the American Registry of Radiologic Technologists (ARRT) or the Nuclear Medicine Technology Certification Board in CT. Other documented training, state licenses, and certifications may also suffice. By 2018, all technologists who perform CT exams will be required to be certified. "These new requirements for 2016 are part of The Joint Commission's continuing work to enhance our standards to better capture risks in diagnostic imaging," says Joyce Webb, RN, BSN, MBA, CMPE, project director of the division of healthcare quality evaluation for The Joint Commission. "Last year, we issued several new standards focused on areas such as imaging equipment evaluation and CT and MRI safety. As part of that work, we also saw an opportunity to further enhance our standards to address CT technologists' qualifications. This was an area where we identified gaps and potential risk. For example, when we started this project there were 11 states that had no minimum qualifications for CT technologists. We are hoping to address that gap by issuing requirements that support one standard of care across our accredited customers." Matthew McGill, director of imaging services at Sebastian River Medical Center in Sebastian, Florida, was ahead of the curve when it came to these new diagnostic imaging services requirements, explaining that, in his position, he always factored in certification when considering any potential hires. "In the year and a half that I have been here, I have not hired anybody that is not CT certified," McGill says. "I try to take a proactive approach in making sure that the people we bring in have gone above and beyond to show what they are doing in the field. Before, you didn't have to have that certification. It was not required. But to me, it showed that you are passionate about what you are doing and you went a little above and beyond." McGill himself has held advanced CT certification for over 10 years. "It's quite common that most facilities would use cross-trained staff who would have their radiology registry or RT(R)," McGill says. "That makes them no less competent than anybody who holds the CT certification but, until this time, there has been no pressure or reason to pursue the advanced certification. For anybody who has been a CT tech, the idea of mandatory CT advanced certification has been bandied about for some time. "For me, you want somebody who has the most knowledge to do the job. Having certification is not a substitute for experience; it is a complement to it." American Society of Radiologic Technologists (ASRT) President Sandra Hayden, MA, RT(T), FASRT, stands behind the changes being implemented. "Improving patient care is an ongoing goal for all radiologic technologists and the ASRT," Hayden says. "To that end, the ASRT believes that all radiologic technologists should be certified by the ARRT or other certification agencies and hold state licensure where applicable. Since the criteria in the updated Joint Commission CT standards list these two options, we believe it's another positive step toward improving the quality and safety of care. As a result, ASRT will work closely with its members to ensure that they have the tools and support to meet the criteria outlined in the updated standards." Both McGill and Hayden say patient safety is a big driver in the changes. 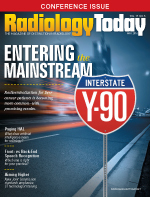 "As written, the majority of changes focus on qualifications for radiologic technologists and updates on safety practices related to the provision of diagnostic imaging," Hayden says. "It appears that the main change is that personnel performing CT in Joint Commission-accredited hospitals will be required to meet the updated standards. The ASRT is ready to provide guidance for its members who work within [Joint Commission]-accredited facilities to ensure they meet the updated standards." "We've become more digital in the field," McGill says. "We are not button pushers, but somebody could just sit back and autopilot this stuff and the image [would still be] produced, more dose or less dose. But you need to be able to deliver the least amount of dose possible [and still provide a] diagnostic image that the radiologist can interpret." The FDA estimates an effective dose somewhere between 1 and 10 mSv during a typical CT procedure. The dose can depend on factors like the size of the body part, the type of procedure, and the type of CT equipment. Contrast that with the 5 to 20 mSv received by some of the lower-dosed survivors of the atomic bombs dropped on Japan in World War II. The FDA says those survivors were found to have a small but increased risk for cancer mortality. "Radiation safety has been a pretty big topic for some time," McGill says, "especially in CT. As a way to answer that, giving somebody a mandatory foundation in how CT works and ways to adjust your protocols and your dose is a way they can curtail the patient receiving excess dose from somebody who may not have that background." The ARRT website says that candidates applying for primary pathway to certification and completing an educational program now must have earned an associate's degree or higher in a respective discipline from an institution that is accredited by an approved agency. Candidates for postprimary certification and registration are also mandated to complete 16 hours of structured education from ARRT-recognized institutions or continuing education opportunities that are an A or an A+, McGill says. "[The 16 hours of structured education] is a relatively new thing," McGill says. "That factor alone forced a lot of techs to get certified sooner." Clinical experience requirements are also a key component in certification. The requirements include completing specific numbers of repetitions for different procedures. "The clinical experience is the most important thing—the most longstanding rule," McGill says. "A long, long time ago, you could just sign up and take a test. Then it was changed to these clinical experience requirements. This is the part where the tech, who is relatively untrained, has to spend time learning about the job, doing the exams, getting reviewed. Then, somebody has to sign them off, it has to be notarized, and they then get to take the test. That is what is going to show a particular person is competent to do it." Once certified, radiologic technologists have to renew their certification and registration of their certificate yearly. Every other year, they are required to report compliance with the continuing education requirements laid out by ARRT. According to Webb, the Joint Commission's work to enhance standards around diagnostic imaging is ongoing. Throughout 2016, they will be exploring risks related to other areas of imaging, such as fluoroscopy. "[The Joint Commission revisions] change the job market a little bit," McGill says. "There are a lot of areas it can affect. There are costs associated with rolling something like this out to the facilities. There are schools that will likely start programs over this. It's a big deal. This is one of the biggest things to happen in CT for a while." — Colin Snyder is a freelance writer based in York, Pennsylvania. EDITOR'S NOTE: In the weeks after we reported that The Joint Commission mandated that all radiologic technologists who perform diagnostic CT exams will be required to achieve advanced-level certification by January 1, 2018, and participate in education that prepares them to achieve advanced-level certification by that date, The Joint Commission decided to eliminate January 1, 2018, as the date when the certification must be achieved and suspended the education requirement due to feedback received. For more information, go to www.jointcommission.org/assets/1/6/TJC_Persp_Imaging_0716.pdf.